Two guys get lost in the desert. That's it. And if you're looking for plot developments, this is all you get: They get even more lost. Gus Van Sant's minimalist landscape film Gerry is like moviemaking detox, for an audience weaned on a steady diet of slick, hard-charging narrative films, and for a once-revered independent director who spent too much time supplying them. After a string of Hollywood (or Indiewood, really) movies that ended with the regrettable Finding Forrester in 2000, Van Sant had what appeared to be an artistic reawakening that's carried him through the better part of a decade, with films like Elephant, Last Days, and Paranoid Park. And it all started in 2002 when he dropped Gerry on the Sundance Film Festival, a place that purports to celebrate independent cinema, but which market forces have turned into a kind of shadow Hollywood. Needless to say, reception was mixed. Gerry haters usually take the same tack: In essence, there's no there there. In their view, 100 minutes of Matt Damon and Casey Affleck wandering around, with long takes, minimal dialogue, and scant psychology, does not constitute a proper movie. And I'll confess that the film is something of a Rorschach blot, in that what you get out of it relies to a large extent on what you put into it. Van Sant and company do have something on their minds, but Gerry avoids the spelled-out themes that are plugged into most movies and which often take away their mystery. What they've done instead is draw viewers into an unusually receptive and contemplative headspace, given them the trace outlines of a man-vs.-nature theme, and provided an exceptionally beautiful place to do some thinking. Where they make their initial mistake is telling. As a family walks past them on the trail, they decide to go in another direction, under the logic that everything is going to lead to the same place. This is a mentality that I think many of us in the modern world share; we're used to having safeguards in place, no matter where we go. Affleck and Damon make the critical error of treating nature like some sort of amusement park, as if there were invisible rails penning them into the ride, ensuring that they're deposited safely back where they started. It's inconceivable that there's no net to catch them—or "dirt mattress," for that matter—because like many other Americans, they don't believe that it's possible to get lost anywhere anymore. There has to be a road, a gas station, or an outpost just over that next hill, because that's how the spread of civilization is supposed to work. Heavily inspired by the films of Hungarian director Béla Tarr, particularly his magisterial seven-and-a-half hour opus Sátántangó, Gerry does remarkable things with landscapes, soundscapes, and screen space—which I'll get to later—but one of the striking things is how funny it is, especially in the early going. Little throwaway bits of improvisation (Van Sant, Damon, and Affleck are all credited screenwriters, suggesting that the dialogue was largely done on the spot) keep things buoyant, like an exchange where Damon describes an episode of Wheel Of Fortune in which a contestant had only a single letter remaining in a puzzle ("BARRE_ING DOWN THE ROAD") and thought a "y" was missing. It's a funny anecdote, and subtly sketches these two characters as more savvy about pop culture than the world outside that bubble. Better still is an absurdist setpiece right out of Samuel Beckett, or maybe an Abbott & Costello routine. After splitting up to "crow's nest" the terrain at higher elevations, Affleck winds up stranded on top of a very high rock. How did he get there? From the looks of it, the rock is impossible to scale. How does he get down? Well, that's where the comedy comes in: Down below, Damon doesn't think he can jump, because he could shatter an ankle, and they'd both be in serious trouble. Damon doesn't think he should try to break Affleck's fall, either. So the solution is to make a "dirt mattress" to soften the blow, a two-foot cushion of desert dust that Damon collects in his "shirt basket." Affleck and Damon play off each other brilliantly—all the more impressive when you consider it was done in one take, which makes the timing important—and again, Van Sant drives home the profile of two guys out of their depth. At this point, as they follow animal tracks into Lawrence Of Arabia territory, we know they're in trouble, and the tone of the film becomes more desperate and labored. It's not an insult to say that Van Sant captures the tedium of walking without progressing, as Damon and Affleck shuffle toward a horizon that inches away from them and only offers the occasional mirage. Obviously, the film risks tedium—and for many, achieves it—but Van Sant, Savides, and Leslie Shatz, who did the astonishing sound design, keep finding new, inventive ways to make each new shot (100 in all) fresh and dynamic. Sometimes, it's a change of perspective, like that first overhead wide shot of Damon and Affleck looking like ants next to the sprawling landscape, or a hypnotic close-up of their faces as they walk in lockstep, bobbing back and forth. Elsewhere, the sound takes on an eerie ambience, like when the two tread close to sunrise on the otherworldly salt flats and the soundtrack veers into science fiction. With its story about naïve young people confronting nature at a terrible cost, Gerry could be considered a minimalist Into The Wild, but oddly enough, the film's abstractions and absurdities reminded me more of The Blair Witch Project. Both Gerry and Blair Witch have characters getting more and more lost in their never-ending quest to return to civilization, and both suggest that there may be no direction home. The big difference between the two—outside of the obvious, anyway—is that the Blair Witch crew keeps circling around to the same spot no matter where they go, while Damon and Affleck walk through a range of diverse landscapes, which at least gives the illusion that they're going somewhere. 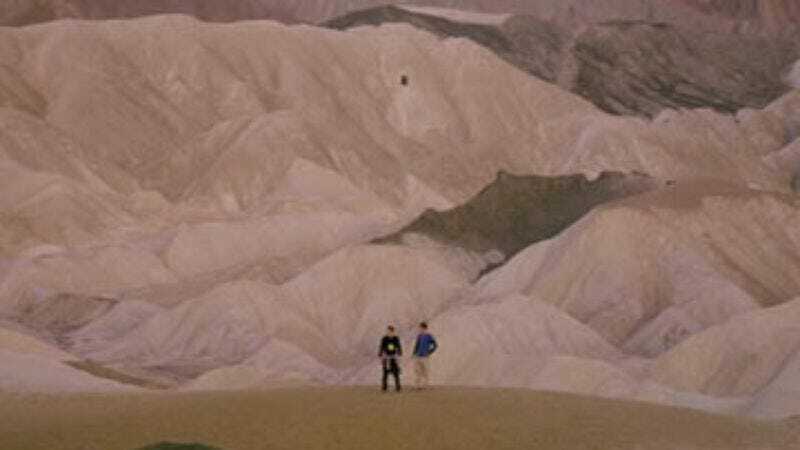 Yet Van Sant, by shooting the film in three distinct locations, severs any continuity from one place to the next: They get lost in Death Valley, end up at the Salt Flats, and spend some time in Argentina in between, which is either one hell of a trek, or Van Sant sending his audience into some elusive mirage. Or, in the case of Gerry on the whole, a blessed oasis.